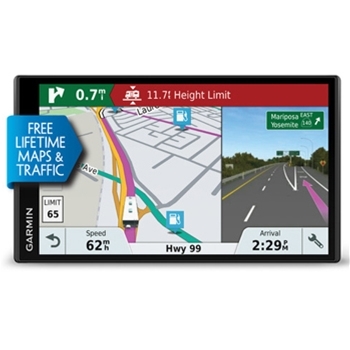 The Garmin RV 770LMT-S boasts a large, high-resolution 6.95” edge to edge color display to show you RV specific directions and points of interest, but can also be used in your vehicle as well. Preloaded North America maps and points of interest will get you to your destination, and everywhere in between with ease. If you aren’t happy with the route you are traveling, the Easy Route Shaping feature is great to modify and include preferred roads and or cities that you wish to travel through with just a touch of the screen. RV routing is easier than ever to accomplish. Simply enter your RVs size and weight and your 770LMT-S will route you specifically based on your limitations, keeping you away from bridges that may be too low, one-way streets, or other restrictions that will keep you from safely reaching your destination. Driver alerts are one of the key features added into this unit. Notices on upcoming steep grades, sharp curves, bridge heights, and more keep drivers alert to their surroundings and help keep you and other people on the road safe. Hands-free navigation allows for voice activated commands, onscreen smart notifications from your phone, and hands-free calling capabilities with a Bluetooth compatible phone. And keeping with Safety, the RV 770 also includes Live Services when paired with a compatible smartphone and Garmin app keeping you apprised of the weather, live traffic updates and even keeps track of your location, allowing you to share it with friends and fanily so they know you are on your way and when you have safely arrived at your destination. Whether you live life on the open road, or are escaping for a weekend getaway all the information you want or need is at your fingertips. TripAdvisor points of interest provide rating and feedback for restaurants, hotels and attractions along your route while the directory of RV services assist you in finding sites with your preferred amenities – whether it be electric hookups, showers, internet access and more! Leave the worry of keeping your maps up to date behind. Wi-Fi map updates allow you to connect to a Wi-Fi connection and download map and software updates without physically being connected to a PC. Let lifetime traffic updates keep you smooth sailing on your route by notifying you of upcoming accidents or road construction issues that may delay your route. 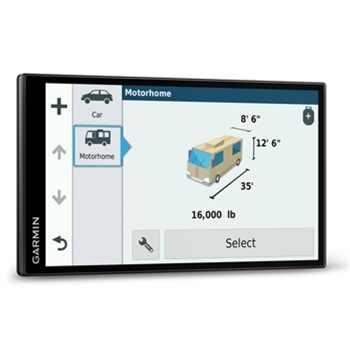 If an alternate address is available to use, your RV 770 LMT-S will offer a re-route option to keep you moving. 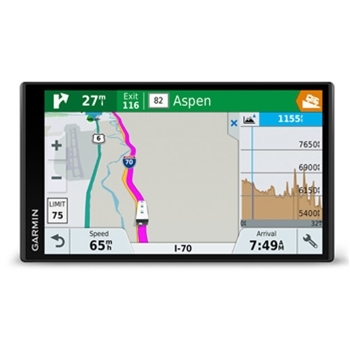 For all of the must have’s while on the road, let the Garmin RV 770 LMT-S be your guide.